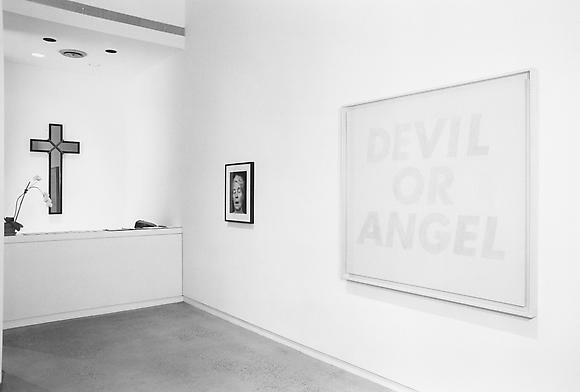 Cheim & Read is pleased to announce the exhibition Three Catholics: Andy Warhol, Edward Ruscha & Robert Mapplethorpe. The exhibition will include painting, photography and sculptural works. Modernism was in large part formed by its move away from the Church, organized religion; by its secular nature. Not unlike children rebelling and separating from their parents, modern artists steered very clearly away from the influence and context of the church. This led to a modernist formalism that eschewed not only spiritual content but eventually any referentiality beyond the artwork itself. It is surprising to realize then that three significant postwar artists: Andy Warhol, Edward Ruscha and Robert Mapplethorpe have in common a strict Catholic upbringing and made art that very much reflects and reacts against that. These three artists have made work that overlaps not only in their various mediums – photography, painting and sculpture – but in their attraction and ambivalence to concepts of high pomp, mortality, and the notions of good and evil. All three confess to a "bad boy" reactionary stance in their approach to art and sexuality. They each knew and admired one another's work and traded artworks between themselves. Their approach can be seen in the subsequent generation in the art of Mike Kelley and Robert Gober. In a famous self-portrait Mapplethorpe poses as the Devil; Warhol admonishes us to "REPENT AND SIN NO MORE ! "; Ruscha depicts the words EVIL and SIN and CHURCH. Other works in the exhibition include photographs, paintings, and sculptures of the Cross and Crucifixion, vanitas mortes, and pastel "miracles". The exhibition will open on April 29th, 1998 with a reception from 6:00-8:00pm. It remains on view through June 27th, 1998.